... well, a seagrass rug. I know what you're thinking: "Wow! This is so exciting! She's so original, so daring! I love a girl who takes risks like she does." So here's the full story. 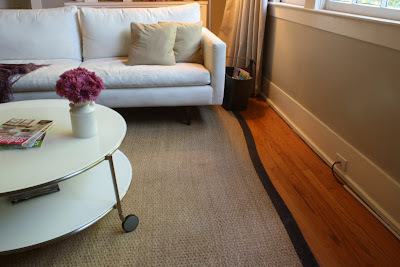 Our seagrass rug after water damage - see the curve? After months of "the swerve" bothering me, I called the steaming company and asked what they might be able to do. They sent someone to take pictures and called about a week later. They're going to replace the full value of the rug! Wa-hoo! I've had my eye on a few rugs for awhile. Like this one from West Elm. It's been seen a lot in the last couple of years, like in Ashley Wick's apartment in Lonny Magazine. I want it. But George is now about 90 pounds... and I swear half of that is hair. 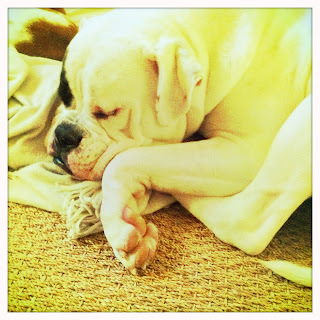 American bulldogs are suppose to be light shedders, but it certainly doesn't seem like it. Our seagrass rug has just about 2-1/2 inches of black trim. You can clean it one day, and the next it's ready for a new rub-down. I love George, but I also love this rug. So he has to go. Does anyone want this dog? George on the seagrass... Shedding in his sleep. Leave a comment below if you're interested in this great specimen of a dog that's keeping me from my rug. But then again, I'm keeping myself from other rugs I want. I'm a clutz, so I spill things, and as much as I love this rug it has no chance against my "oh no!" butterfingers and the dirt from the doggies. Here's just one more I've to considered. But again, spills and doggie-paw dirt are an issue. 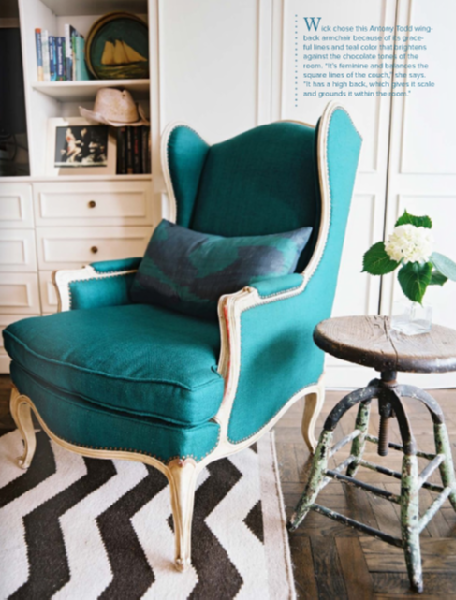 Emily Henderson used the Andalusia Rug in a recent episode of "Secrets from a Stylist". I love them both, but the seagrass stands the test of time, beauty and dogs. It should be delivered in about a week, so I'll post a follow-up. Any experience with seagrass rugs? Any rug lustin' going on in your parts? 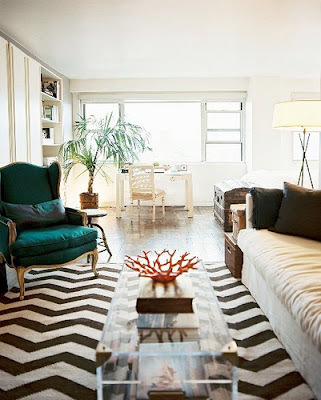 What do you think of the chevron / zigzag and Andalusia rugs from West Elm? Like 'em? Think we could keep them clean if I changed my mind? Get this: There have been more doggie accidents on the seagrass rug than you would ever imagine. Not a single one is visible. :) You just blot the rug to remove the urine, spray Nature's Miracle and let it dry (with paper towels underneath the rug). hi! can you tell me where you ended up getting your new seagrass rug? i have 3 dogs and am so glad to see that Nature's Miracle will work on seagrass! thank you! It's held up well! And was a great price for a 9x12!